Sometimes malpractice is easy to spot. In the case of Regina Turner, a St. Louis neurosurgeon operated on the wrong side of her brain, leaving her unable to speak or walk. Anyone looking at the photos of her bandaged head can immediately see what went wrong. The doctor won't answer your questions. As a patient, you have every right to ask questions and get them answered in a timely manner. If your doctor dances around a question, refuses to return your calls, or seems to avoid giving you a straight answer, it's possible that there's something she is not telling you. You have unexplained, severe pain. Every surgery and medical procedure has possible side effects, but if you are experiencing pain that is an unexpected complication, you may have reason to suspect Missouri medical malpractice. It's rarely a good sign when you see the nurse rushing to call the doctor and the doctor scratching his head trying to figure out what went wrong after a “routine” procedure. You are getting worse, not better. If the doctor's treatment was successful, then you should be feeling at least a little better every day. If you feel worse than you did before taking a prescribed medication or undergoing some type of medical procedure, then there's a chance that someone on the medical staff screwed up somewhere. Another doctor expresses surprise at the care you received. Whenever you suspect medical malpractice in Missouri, listen closely to what other medical professionals are saying regarding your condition. For example, if a nurse is surprised at the medicine you were prescribed or the way you were bandaged, or if another doctor remarks that something is “unusual,” it's possible these other healthcare professionals are indicating that something was done wrong in the initial procedure. An experienced St. Louis medical malpractice attorney believes you have a case. Request a free consultation with a lawyer who is familiar with cases of medical malpractice. These skilled attorneys recognize signs of medical malpractice and can help you prove such claims. 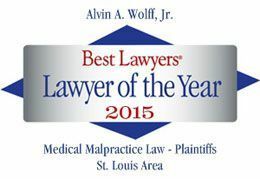 To set up an appointment today with the same law firm that is representing Turner, or to request your free copy of The Guide on How to Pick a Lawyer, call Alvin Wolff at 314-241-2500.